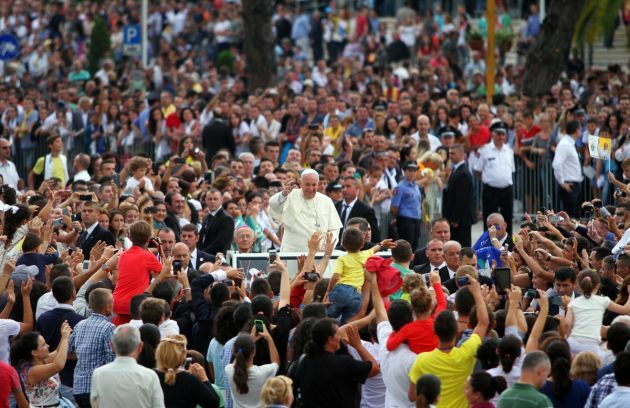 (Photo: REUTERS / Arben Celi)Pope Francis waves during his visit to Albania, in Tirana September 21, 2014. Pope Francis was on a one-day trip to Albania - his first to a European country - to pay tribute to followers of all religions who suffered some of the worst persecution in the 20th century, and to hold up the impoverished nation as a model of inter-religious harmony. Pope Francis has warned during a visit to Albania that religion can not be used to justify violence, in an apparent reference to the havoc created in terror acts by the Islamic State in Iraq and Syria. "May no one use religion as a pretext for actions against human dignity and against the fundamental rights of every man and woman, above all, the right to life and the right of everyone to religious freedom," said Francis on Sunday. Pope Francis arrives at Tirana's Mother Teresa international airport on Sunday for his one day visit to the majority Muslim country where Catholics only account for 10 percent of the three million population. "Let no one consider themselves to be the armour of God while planning and carrying out acts of violence and oppression!" Francis said speaking at the presidential palace in Tirana before of Albania's leaders. The Pope praised the peaceful coexistence between religions in Albania where Muslims make up nearly 60 percent of the population and Orthodox Christians account for nearly the same number as Catholics. "The climate of respect and mutual trust between Catholics, Orthodox and Muslims is a precious gift to the country," said the pontiff. "This is especially the case in these times where an authentic religious spirit is being perverted and where religious differences are being distorted and instrumentalized. "This creates dangerous circumstances which lead to conflict and violence, rather than being an occasion for open and respectful dialogue, and for a collective reflection on what it means to believe in God and to follow his laws." Snipers were present on rooftops in Tirana during the papal visit. Before the Pope's visit to the country where Mother Theresa was born, there were Italian media reports that security has been tightened in Saint Peter's Square after intelligence services intercepted a possible plan to attack the Vatican. Muslims and Catholics attended the Pope's mass in a square named after Mother Theresa. Tirana's capital's main Boulevard Martyrs of the Nation was decorated with Albanian and Vatican flags. There were also pictures of 40 Catholic priests who were persecuted or executed under Stalinist dictator Enver Hoxha, who declared Albania the world's first atheist State in 1967, Britain's Daily Mail reported.